One of the largest ski areas in France, Les Sybelles links no fewer than six excellent ski resorts, covering 310 km of ground. Nestled in the beautiful Maurienne Valley, the resorts of La Toussuire, Le Corbier, Les Bottiéres, St Columban des Villards, St Jean D’Arves and St Sorlin D’Arvescomprise a wide range of terrain suitable for all ski levels, from beginner to expert. Unique natural sights include views of the stunning, 3514-metre-high Aiguille d'Arves peak, and the area's abundance of off-piste slopes means that it's never hard to get off the beaten track. Property in the area is concentrated in its small, friendly villages, and numerous amenities provide entertainment at every turn, making this area a perfect destination for serious skiers and holidaymakers alike. There's no shortage of things to do in Les Sybelles for families, including in the summer months, when activities such as mountain biking and hiking are popular. The area is a frequent endpoint for prominent cycle races, including the Tour de France and the Critérium du Dauphiné. Buying a property in Les Sybelles isn't just a great long-term investment; it's a lifestyle of fun, culture, and outdoor sports. Les Sybelles has a small, spread-out population. The largest village, the commune of La Toussuire, numbers only 556 residents. This means that even in peak season, it's possible to ski on pristine, empty slopes. 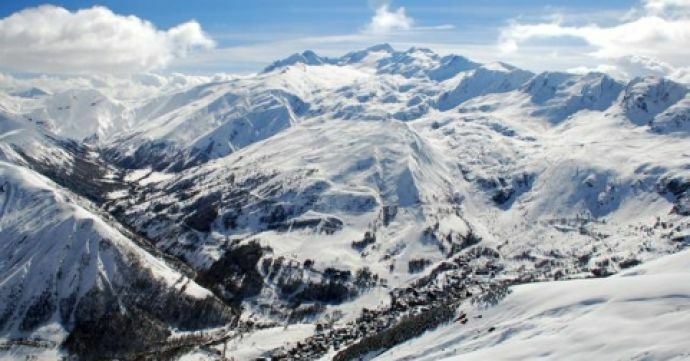 As well as 310 km of linked skiing pistes, comprised of 20 green slopes, 40 blue slopes, 31 red slopes, and 5 black slopes, the Les Sybelles resort includes 2 snow parks, snowshoeing trails, dog sledding, a cinema in Saint Jean, ice skating, paragliding, pools and spas. In summer, the Maurienne Valley is one of the best cycling areas in Europe, and other activities include sightseeing, hiking around the region's beautiful lakes, archery, and rock climbing. Les Sybelles is set at an elevation of 1,100 to 2,620 metres high and has a total of 68 lifts. As well as outdoor pursuits, the area is known for gastronomy. The culture is traditionally French in style, best enjoyed in the various après bars and superb Savoyard restaurants – such as those famous for their mouthwatering cheese fondue. Festivals, including New Year's Eve and Christmas, are well-celebrated here. Residents enjoy art and classical music, and events are held year-round. During August, la Semaine de la Gastronomie sees locals and visitors alike flock to the area's week-long celebration of all thing’s food. The birthplace of French Beaufort cheese, Les Sybelles also has a number of fascinating, small museums which delve into the region's traditions and history. It's a favourite spot for French people, who make up 60% of the region's visitors. 30% come from Northern Europe, and the remaining 10% come from other areas of the world, particularly Asia. Les Sybelles is very accessible; once off the slopes, the resorts are very pedestrian-friendly and there's rarely any need to get in a car. The Three Valleys are nearby and can be reached by gondola from Orelle, just a short drive away from Les Sybelles. Major draws to Les Sybelles are its world-class skiing and spectacular views of mountains - including the towering peaks of Les Aiguilles d’Arves and le Pic de Bure. However, it's also a good choice for smart property investors. Les Sybelles is appealing because of its diversity; out of the area's six ski resorts, four are traditional villages, whilst two (La Toussuire and Le Corbier) were purpose-built in the 1960s. There is, therefore, a wide range of properties in this area, from small mountain chalets to tall, modern apartment blocks. The vast majority of resorts are 100% ski in, ski out. Recent investment in Les Sybelles has focused on improving infrastructure, adding ski lifts (including a new lift which allows skiers to reach Les Corbier's peak in five minutes), and installing a 150-metre zip line at La Toussuire. Smooth slopes are ensured by the addition of 514 snow cannons, which stand ready to blast out artificial snow should natural weather conditions be disappointing. MAULIN.SKI, which operates three of Les Sybelles' resorts, has a further €30 million of investments planned before the end of 2019. The snow report and weather reports for Les Sybelles are both consistent throughout the ski season, which runs from December to the end of April. Around 46% of slopes have snow-making machines installed, ensuring excellent skiing throughout the season. Snowfall is generally highest between January and March, with plenty of bluebird powder days throughout. January tends to have the deepest snow (40cm on average), and April the thinnest (19cm on average). Temperatures range from -9 degrees Celsius in January to 21 degrees in July. For updated snow and weather reports, take a look at our Les Sybelles resort guide here. The nearest airport from Les Sybelles is Chambéry, an hour and 20 minutes away by car or taxi (98km). Lyon Airport (174km) is two hours' drive. Buses from both also travel to Les Sybelles, with around the same journey time. Bus shuttles run between the resorts and the train stations of St Jean de Maurienne Arvan and St Avre-La Chambre and take around 30 minutes. Driving from Calais will take around 9 hours on the motorway but will allow you to take in all the beautiful scenery France has to offer on your way.